Welcome to Weber & Scher Mfg.Co.,Inc. We pride ourselves in our wide range of top-quality machinery. In addition to a complete cable/wire producing lines, we excel in integrating components to build state-of-the-art systems for forming, welding, splicing, accumulating, filling and corrugating cables and wires of all kind. Our complete line of cable/ wire producing solutions is constantly growing. That's because, we will not ask you "What kind of machine do you need?" but "What do you need to accomplish?". Then we will help you choose the right equipment for the job. If we don’t already make it, we’ll design and build it to your specifications. Please select a category from the top navigation menu to learn more. 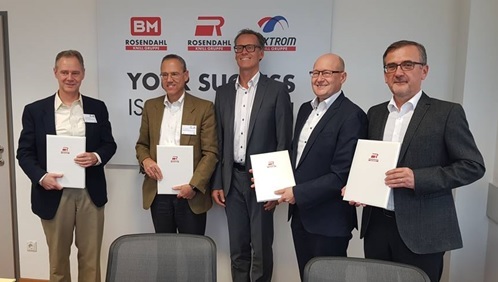 We announce with great pleasure that Rosendahl Nextrom GmbH has purchased the technology for seam welded smooth and corrugated metal tape sheathing systems from Weber & Scher Mfg. Co., Inc. by means of an intellectual property agreement. For more information, visit www.rosendahlnextrom.com or click News above. After 82 years in Newark, New Jersey, the Company relocated their operations into a new state of the art facility in Lebanon Borough, NJ.